This forum was billed as an iInaugural event to elevate conversation about women in cycling. Women still cycle at much lower rates than men in the United States — making up just 24 percent of bike trips in 2009. But that trend is shifting. This Forum will be the first national gathering specifically dedicated to raising awareness about and discussing how to engage more women in bicycling. Sue Macy will provide unique inspiration to kick off that discussion. 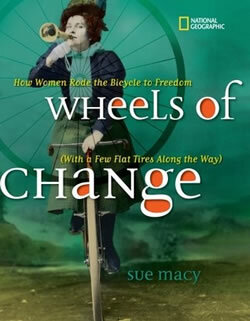 Among other accolades, Wheels of Change was named to the 2011 Best Books lists from the Washington Post and the San Francisco Book Review. “Ms. Macy wrote a captivating book about the bicycle’s historic role in women’s empowerment, and we hope this forum will be the catalyst to begin closing the gender gap in today’s cycling environment,” said Kit Keller, Executive Director of the Association of Pedestrian and Bicycle Professionals.